I thought it was just baby feet. Greyson Michael Kelly, 1 day old. But it never went away. That feeling I get when I look at them sometimes. They awe me. 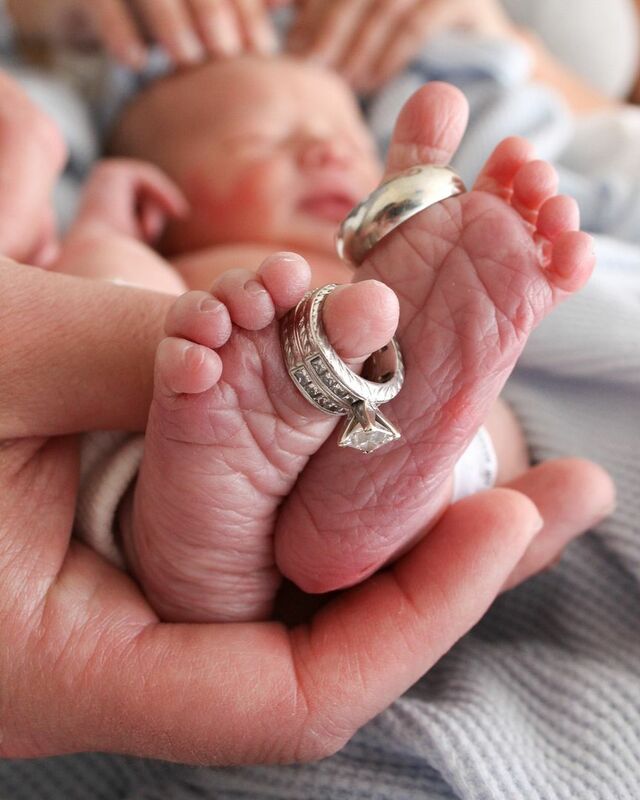 Greyson and Parker's feet. Their perfection in every cell. I close my eyes and I can picture them. Details memorized. Square. Solid. Strong. Each toe with a completely different personality. Sometimes it's so hard to believe that somewhere inside some neurons went wonky from autism. How, when their feet are just so perfect? I looked at them today and just stopped. I slowed down. Why don't I notice how amazing they are every day? What other masterpiece is right in front of me waiting to be discovered if I just slow down? We are slow. So incredibly slow. I have to practice going slow because it's not natural for me. Although it is 4 letters long, SLOW is not a bad word in our house. It can't be. My boys are slow. They learn slow. Just a fact, not an insult. It's a gift from God to help me notice the beauty of the World. I'm practicing slow. One day I might be good at it I hope. I look for things like their feet. Things that stop me cold, slow me down and make me think. Things that make me feel blessed and amazed. Things that remind me that I don't need a single thing in Life, I just need to be open to recognizing the beauty in feet. Those moments are my own little prayer to God, a grateful recognition of the simple yet amazing. Feet. Like words, they help us travel the World. The more I look for things to inspire me, the MORE I find. TRY IT. It's so awesome. I want you to come here to learn more about autism. But I also want you to come here to find your happy. To recognize your own religion of feet, whatever that might look like. Because I think it's so much easier to be kind and accepting of others when you are kind and accepting of you. When you come from a place of happy. Some days I wonder, Why is life so hard? But on some days, like today I think, How are you so happy? You have two kids with autism. I don't understand why you are so happy still? But that's just the thing. I am that happy because I have two kids with autism. Autism is teaching me this sick, sweet, painful, slow, real happy. A happy deeper and with colors truer than I've ever seen before. Colors I never knew existed. Colors Crayola would covet. And as I type I still don't quite understand it. But since it's so much easier for me to be happy, I just accept it for what it is. Today was a very important day. Do you know why? 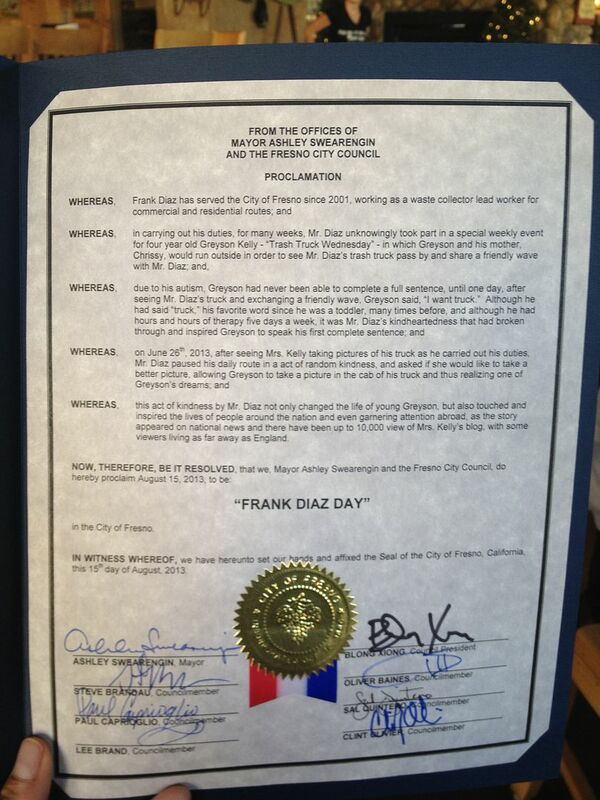 Today is Frank Diaz Day. True story. And today we went to City Hall and honored a man and a Friend, and a story that will simply never get old to me. The story is just so baby feet. And one day, when my Life on Earth has come to an end and God and I are chatting, I will thank him specifically for today. I will thank him for my many blessings not in disguise. You can watch the News Report here. 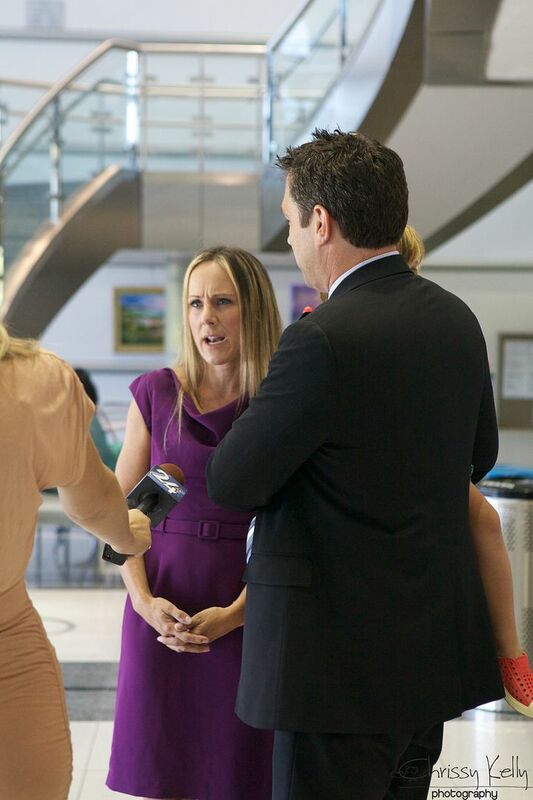 We were so happy to be with the amazing crew at KSEE-24, NBC, Angela and Kevin again. I'm pretty sure that all of our paths were meant to cross exactly like they are now. And how awesome that my back to school letter was published in the Huffington Post today, on Frank Diaz Day. Which is awesome and exciting and amazing. And the funny thing is, a little while after I decided that I just didn't need Huffington Post's recognition for validation, it happened along. You're so tricky that way, God. And it was a little scary, because they care about things like commas and stuff. And there are lots of rules, like certain words need to be italicized. And you can't really use made up words as much- or use feet as an adjective. But it was a fun outfit to try on for size. Happy Frank Diaz Day. Hope it was feet. Made me cry those really awesome kind of tears. Love that I had this awesome story to read after being up for an hour in the middle of the night rocking my daughter back to sleep. I just wanted to say I visit your page every morning as a reminder to find my happy in the day. Your right slowing down is the hardest part of parenting a child with Autism, but possible the greatest gift. It's amazing the things you appreciate when you take the time to look around. Thank you so much for all of your words. They help remind me I am not alone in the crazy world of being a parent of a child with super powers. Yea! for Frank Diaz day!!! How great of the city to honor and recognize him. 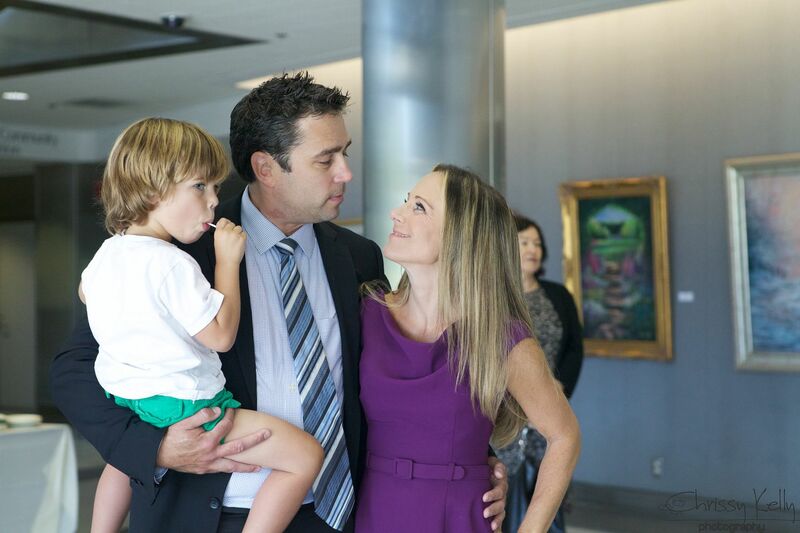 And look at the Kellys, all camera ready <3 What a beautiful family. This place makes me more happy everytime I visit. What you have created here is baby feet - perfect and amazing. I love how you have this tendency to get me all teary eyed while reading your beautiful writing, and then end on something that just makes me laugh out loud - "I hope your day was feet." Thank you! Ahhh, congratulations CHRISSY AND FRANK! And the whole Greyson family!! What a big day. And what a big day everyday that each of us can say that we are HAPPY. So, so happy for you. I am so, so proud of YOU! And so, so HAPPY for you too! Beautiful, beautiful story, the Frank story, that is. And your story too. I don't come here everyday for autism, but because of a disability I have. It's funny...I come here and I feel "the I can do anything feeling". It so good to feel alive again. Disability sometimes makes you want to die inside. It sometimes makes you want to just live in your little box. Because it is hard to let others see you are different and have special needs in other to live in this world. But, I can do it. It is ok. Some will help me and some won't and it is ok. I can let that disturb me or I can push my limits. It is so much more work and effort, but I can feel and do feel fulfilled and joy again. Now. Thanks for words that I couldn't give myself. I love feet too. Ah, baby feet! My own kids' feet, I watch them as they grow and change also. Frank Diaz is who we should all strive to be like. I just love following this story and your blog. Hugs!